Whether you label it as a fruit or a vegetable, there’s no doubt that this mouthwatering piece of produce is a longtime staple in Southern cooking. As the seasons shift and the summer sunshine pours onto our slice of the Georgia coastline, perfectly ripe vegetables start to appear in markets and home gardens. Plants typically respond to the changing of the season with abundance: Herbs burst with fragrant leaves, yellow squash stretches out from its vine and lattices hang with the heavy burden of plump, red tomatoes. For many Southern cooks, few crops exemplify this time of year more than a tomato. Growing up, my mother’s kitchen counter held piles of her garden’s yield. We ate fresh fruit and vegetables all week, but Friday night dinners during the summer were special. To go with her fried chicken, potato salad and pickled peaches, she would prepare a platter of sliced tomatoes with crisp cucumbers, dusting each with a light covering of salt and pepper. Our family approached that day with reverence, and there were never any leftovers. Quality control was important. It was a rule that the tomatoes were never placed in the refrigerator, as they would lose that “from the garden” flavor. 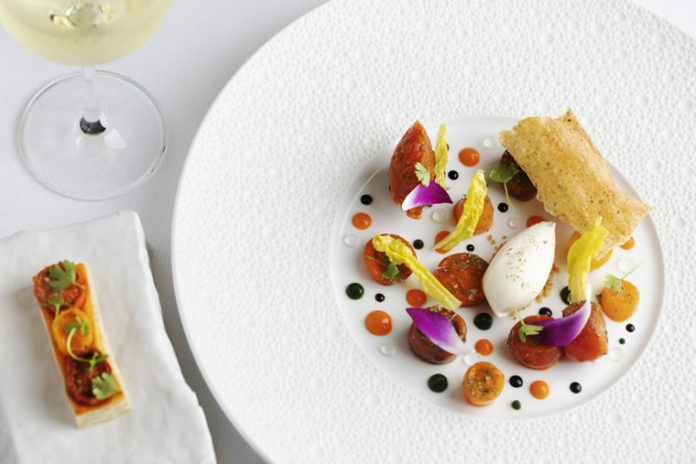 In the Forbes Five-Star Georgian Room, Chef de Cuisine Aaron Bellizzi appreciates the same simplicity. “During the summertime, when tomatoes are in season, we pair corn, stone fruits [such as peaches and plums] and herbs,” Bellizzi says, adding that these ingredients help to balance the flavor. “A lot of times, we try to keep it simple. Maldon sea salt, Espelette pepper—[which is] a prized dried French pepper—and a little bit of black pepper [and] olive oil is fantastic.” Though the eatery is far from a casual family kitchen, the Georgian Room maintains a warm, inviting environment that makes diners feel right at home. The food is the star every evening and, in the summer months, tomatoes play an important role on the menu, dotting everything from petite salads to more complex dishes, sauces and accompaniments. 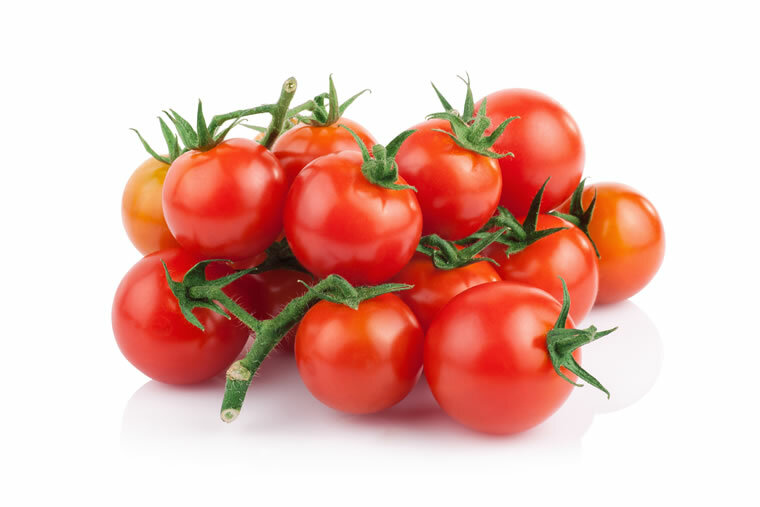 The traditional ways that tomatoes are prepared, in which they are treated much more like a vegetable than a fruit, often leads to confusion about what exactly a tomato is. Fruits are carriers of seeds, tasked with starting new plants. A tomato, along with cucumbers, peppers and avocados, has seeds buried in its juicy interior ready to propagate the plant. Yet, its classification is regularly a source of debate. The Supreme Court even weighed in on the issue in 1893: In Nix v. Hedden, Manhattan wholesalers John Nix & Co. wanted to avoid a new tariff on imported vegetables and cited the scientific reason. The court responded that tomatoes weren’t eaten or prepared as fruits, and that the company should pay its tax. Since that time, organizations have referred back to the case as a guideline. Even the U.S. Department of Agriculture classifies tomatoes as vegetables, although Tennessee and Ohio have both declared it the official state fruit. 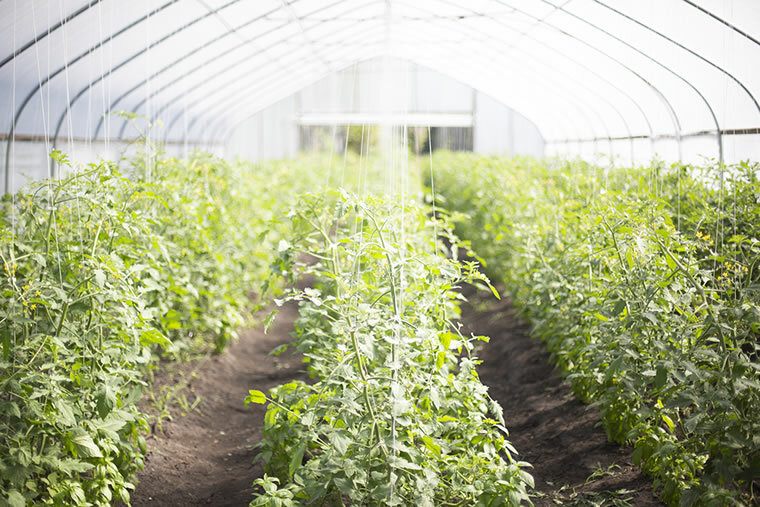 This appreciation for the freshest ingredients supports local farmers like Rafe Rivers. He and his wife, Ansley, own and operate Canewater Farm, along with Farm Manager Brendan Gannon and the rest of the crew. A certified organic farm using sustainable methods in Darien, Georgia, Canewater is able to provide a variety of produce to restaurants, retail stores and farmers markets, including the Georgian Room. Tomatoes, though, have been challenging. “Tomatoes are probably the trickiest crop to grow on the Georgia coast, organically, in large production,” Rivers says. The fresh picks are in high demand, as the tomato is particularly integral to Southern cuisine. Tomato pie, tomato gravy and chow-chow, a sweet and spicy garden relish, frequently make an appearance in Southern kitchens. In the 1950s, home chefs often folded tomato and gelatin into ornate molds for a tomato aspic. Tomatoes also serve a unique function for another popular regional dish, neutralizing some of the slime associated with cooking okra. Some traditional favorites are even more simple, such as tomatoes thickly sliced and placed on fresh white bread with a spread of mayo, or even added to a burger fresh from the grill. Whatever your favorite tomato preparation is, this is the time to enjoy it, as nothing beats perfectly ripe, in-season produce. Aaron Bellizzi, chef de cuisine at the Forbes Five-Star Georgian Room, shares an easy recipe for a delicious tart that he pairs with the restaurant’s tomato salad. Partially defrost the frozen puff pastry, then use a lattice roller to punch holes in the dough; if a lattice roller is not available, a fork can be used as well. After prep, brush the dough with the tomato vinaigrette. Place four slices of marinated cherry tomatoes on top, then put thyme leaves on top of the tomatoes. Bake at 350 degrees F until golden brown. In a large mixing bowl, combine the tomatoes, garlic, olive oil, salt and thyme leaves. Roast ingredients in the oven at 300 degrees F for 30 to 40 minutes. Once cooked, blend on high to emulsify. Add the Champagne vinegar and, if needed, additional olive oil. Use a fine-mesh strainer to catch any clumps, then season with salt and pepper.